American Swimming Magazine, 2007(1), 34-38. Since hand force is directly related to swimming velocity (Havriluk, 2004, 2006a), it is important to exert a maximal amount of force. Bilateral symmetry in hand force (i.e. an equal force with both hands throughout the range of motion) will not only help to maximize propulsion, but also minimize resistance. As obvious as this may seem, only a small proportion of swimmers have bilateral symmetry in hand force. 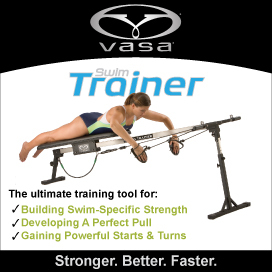 Hand force is a key factor for swimming fast. Bilateral symmetry in hand force is important to maximize propulsion and minimize resistance. A synchronized underwater video and force analysis is necessary to quantify asymmetries. The use of visual and kinesthetic cues can help swimmers minimize these differences. Improving bilateral symmetry in hand force will improve performance.